Coltrane by Paolo Parisi is the graphic biography of famous jazz saxophonist and pioneer in free jazz, John Coltrane. This novel presents snippets of his life between 1936 to his passing in New York in 1967. His early childhood was spent in Hamlet, North Carolina where his father, grandmother and grandfather all died in a brief period of time and his mother had to leave him with a cousin so she could work. In this solitude, Coltrane found solace in the music he created with his saxophone and it was here his talent bloomed. The novel follows his rise to fame, personal highs and lows and struggles with fame, drink and drugs. This is a beautifully drawn graphic novel and expressions and emotions are captured superbly, even with minimal detail. I must admit I did find it slightly hard to follow as the time periods are not in order and do jump about from one page to another. I feel this may not be an issue for people that are more aware of Coltrane’s life story already but as this was an introduction for me, it was a little daunting. There are a few pages which include slightly more details on Coltrane and his life; these were the parts I enjoyed the most as they really gave in insight into the man he was. 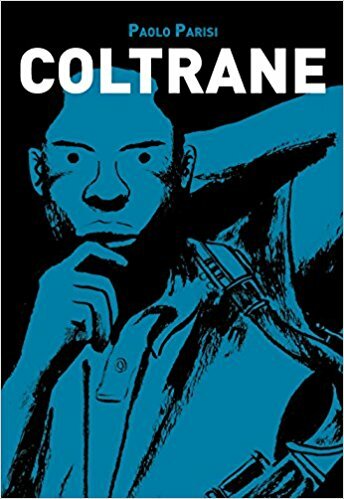 I would recommend this to anyone that already has some background knowledge of Coltrane to get the most from this beautiful graphic novel. Buy Coltrane by Paolo Parisi from Waterstones here.